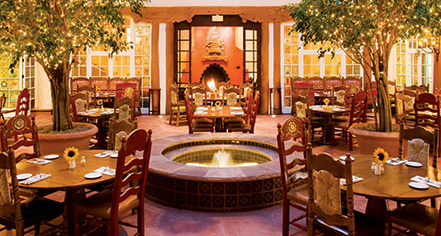 La Plazuela is an enclosed courtyard restaurant featuring Nuevo Latino and traditional New Mexican cuisine in Santa Fe and has been called one of the most beautiful dining rooms in town. The menu is loaded with imaginative selections made with the finest local ingredients. The restaurant is open daily for breakfast, lunch and dinner. Reservations are recommended. 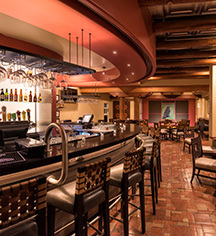 La Fiesta Lounge offers snacks and a New Mexican lunch buffet, plus live entertainment and dancing nightly. The fifth floor Bell Tower Bar is open seasonally for cocktails and incredible sunset views.